Manufacturing the components you need is one thing, getting it to the finish you and your customers require is another. Eastside has a dedicated liquid paint facility focused on A finish coatings to meet the most stringent quality guidelines. Working with all paint suppliers, Eastside can review your coating performance requirements, conduct relevant test components and work with our suppliers to ensure it meets your appearance, performance and costing requirements. Basecoat / clear coat, single stage urethanes, epoxies, and sandable primers are all part of our everyday liquid coatings offering. With trained professional painters, Eastside has one of the most experienced liquid coating teams around, allowing us to continuously train our team on new technologies and equipment which only allows us to ensure your needs are properly assessed, properly quoted and consistently delivered. We continuously invest in the equipment to meet your needs today and in the future with 11 spray booths, and capabilities of refinishing parts up to 50 feet long. 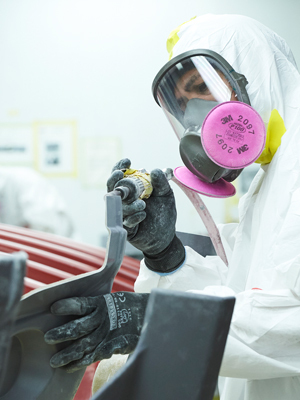 This allows our team to paint any volume levels you require., Whether it is one part at a time or thousands of parts per day, we can meet your needs. Eastside has a team dedicated to developing racking, ensuring we develop the racking you needm allowing us to coat the components in the most ergonomically friendly way and maximiz=ing quality and efficiency day in and day out. Lastly, Eastside’s quality department has the relevant equipment to certify the coating we provide are to the specifications your require. With equipment dedicated to testing gloss, color, adhesion, hardness and any other factors you may require we can provide relevant certifications that the coating we provide is to the specifications you require. 2. To ensure we meet the quality standards of your components, we have a dedicated team to ensure parts are prepared and cleaned properly prior to being painted to ensure the surface finish is to your standards and the coatings we apply are properly adhered to the surface of the part. 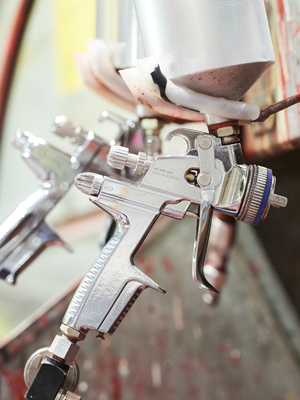 Having our manufacturing, assembly, part preparation and liquid coatings in a single location allows Eastside to control the cost, quality and leadtime of components we supply our customers. Giving you a single vendor to deal with and work with simplifies the product offering as well as gives you a single accountable supplier for your production needs.